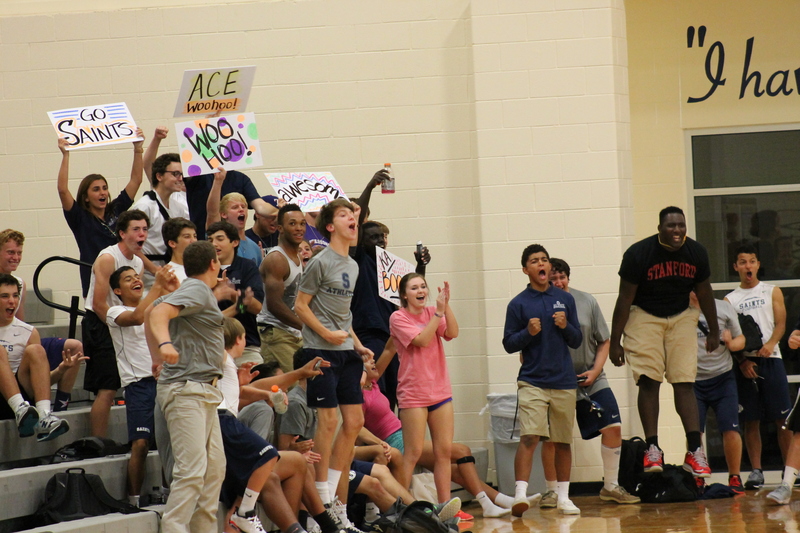 Led by senior outside hitter Allena Heath and senior middle blocker Imani Davis, All Saints’ Varsity Volleyball triumphed over the Episcopal School of Dallas, last Tuesday. Senior Imani Davis, and freshman Ashton Mares, both totaled double figure kills throughout the three sets. Davis resulted in 14, while Mares had 10, all with the assistance of freshman setter Sadie McCarter. With a slow start in the first set, the team made a steady comeback and prevailed in 3 straight sets. The team stuck together and came out on top, but not without the help of three seniors who are going to continue their volleyball careers in college. Katie Karbo is committed to the University of Houston as a libero, and will be attending in the fall of 2016. When I asked her what she was most looking forward to, she said ”I’m most excited about getting to play with such incredible teammates!” The other two seniors are Allena Heath, committed to Campbell University in North Carolina, and Imani Davis, who will be attending and playing volleyball at the University of Southern California. The next home volleyball game will be Thursday, September 10th at 6. Everyone come out and support your Saints!